Meme Courtesy of Alexandra Steadfast, 2017. Alexandra Steadfast is an artist, writer, and clinical therapist in Los Angeles with a life long affinity for historical costuming and couture. She makes memes about Feminism and Mental Health combined with images of couture, classical and vintage art. We noticed her work in our feed, she is steadily getting traction with her Instagram @alexthememeconnoisseur. I was so happy to have her talk with our community about her work and the importance of using your voice. Hi Alex, How are you? Pretty good all things considered. Why did you start making memes? It all started with a JPG couture dress I saw in my instagram feed. My instal(insta?) feed at the time consisted essentially of couture and feminist accounts. I sent the post to a friend with a caption, joking it would be a funny meme. She was a a big memer at the time and enthusiastically encouraged me. It was a fun way to combine my favorite things, couture and feminism, and a therapeutic way to deal with my frustration with the patriarchy and mental health stigma. What was important about using fashion images in your memes? I love how wild couture can be, just impossible to wear works of art, I love looking at it and admiring all the delicate and exhausting work that goes into each piece. And it’s also the epitome of privilege. I wanted to combined my thoughts about mental health and frustrations with misogyny with something extremely exclusive, almost cold, beyond reproach. It felt strangely empowering pairing these beautiful models, who are essentially meant to only be seen and not heard, with strong positions on human rights and mental health. Do you like fashion? Or do you just enjoy the visuals? I love fashion, but especially historical fashion and couture. It’s completely unrealistic and that’s what I like about it, it’s a fantasy, a costume almost. It can and will transform the person who wears it. It’s empowering to imagine changing how you’re perceived with an outfit. We see it every day, how someone is treated in a suit vs in sweatpants and a hoodie. I use fashion like armor. Some of my favorite designers are Valentino, Dior, Marchesa, Comme Des Garcons, Vivienne Westwood, Mary Katrantzou, Christian Siriano, and Elie Saab. Do you have favorite garments in history? I confess to a preoccupation with Renaissance garments, mostly due to the symbolism attached to various tiny details of the garments and jewelry, the intricate beading and lacework, and the paintings that have survived to this day. Lady with an Ermine by Leonardo da Vinci is a good example. Do you participate in the fashion system (Do you work in fashion)? I do not. I did however intern at a well known fashion company briefly straight out of high school, it was very exciting to be part of fashion week in Los Angeles, but at the time it was not possible for me to continue. How do you choose your images? I do a lot of Google image searches! I choose models that have expressive faces, powerful expressions, and couture that says WOW when you see it. I also use vintage and classical art sometimes, if the expression of the subject fits the meme. I also strive to be as inclusive as possible, I want people to see not just white models in couture, because representation matters. The image searches always take longer when I search for any specific background, which is very telling of the white washing in the couture scene, and it’s definitely not for lack of diverse models. I follow lots of major couture brands, and some of them are starting to be more inclusive with their models, better late than never I suppose. Your Instagram is growing everyday! What has been some of the positive and negative responses to your Instagram? The most positive messages I get are related to my mental health posts where I share my own mental health journey, and tips on dealing with misogyny, it’s very heartening to know something I share is helping someone else. Negative responses are from garden variety trolls, I don’t even pay attention at this point, just block, delete, and move on with my life. Why do you think most fights of oppression forget intersectionalism? I’m a realist and a bit of a pessimist. I think most people will always be preoccupied with their own problems, and if it’s not their problem, then why bother? How do you think white feminists can fix this? I think the best way is to just pass the mic. No need to air hurt feelings or rants about how you’re not a racist, instead give POC/WOC the space, the platform to share what they need to. And of course listen to what is said. March in solidarity with BLM if you can, donate if you can, repost POC/WOC content if you can, include diversity in your memes. Process hurt feelings with white friends, not POC/WOC. Do you have any advice for those using Instagram as a platform for intersectional causes? Pass the mic! repost POC/WOC, include diversity in your content, representation matters! I think they key is not further burdening POC/WOC whenever possible, and making a conscious effort to be inclusive in your content, especially if your content is image heavy. White people who are wondering how: literally count how many posts you make with white models vs POC models, and work to even it out. It really doesn’t have to be complicated, look at the content objectively and the bias will be right there in your face. No need to mope about it forever, just make the change. As long as people want the express themselves, fashion shall live. It’s art you wear, no matter if its thrifted, DIY’d, or straight from the run way. Never! A meme exists to be repeated, repurposed, and re-imagined. I’d venture to say fashion is a type of meme, re-imagined, re-purposed, and often repeated to mean different things to different people. Do you have any future plans? 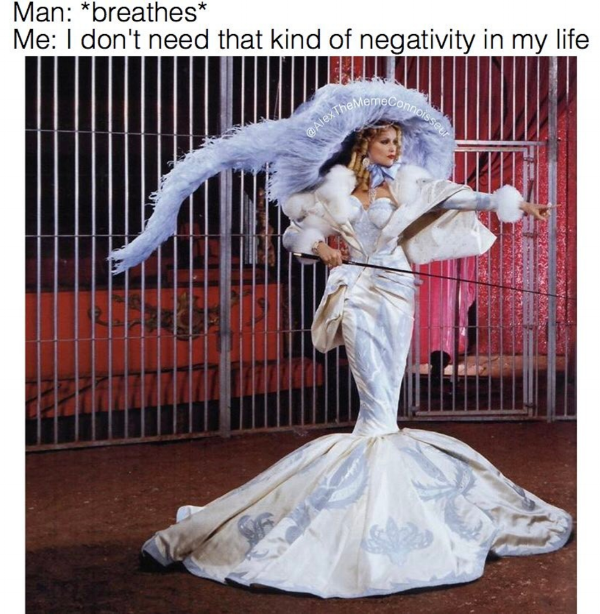 Continue writing, continue making memes, and continue admiring couture. Thank you to Alexandra for interviewing with us, having a little levity, and using your platform to discuss tough issues.